We’ve arrived at the doorstep of another weekend, which naturally means another chance of rain and storms. Let’s discuss how things should unfold. First, we’ll end the week on a mostly quiet note. Look for a good deal of clouds today. A few showers were seen on radar this morning down toward Matagorda Bay. Models aren’t especially bullish on rain chances today, but I wouldn’t be shocked to see some passing showers or even a thunderstorm, especially along and southeast of US-59 today. Temperatures will range from near the upper-70s to perhaps 80 or so with any sunshine this afternoon. Clouds will thicken up further as onshore flow ramps up. As moisture increases over the area, I expect a good deal of showers to develop and lift from south to north across the region. A thunderstorm is also possible. Most of us should just see a little rain tonight and Saturday morning. At this point nothing significant is expected. Low temperatures will be quite warm tonight and Saturday morning, barely dropping below 70°, if at all. Like last weekend, I am going to set you up with a user’s guide Q&A to this weekend’s storm. When is it going to rain on Saturday? Overnight showers may try to diminish on Saturday morning. But any break should be relatively brief New showers and some thunderstorms will form in the later morning, especially on a line from Victoria to Sealy to Conroe to Lake Livingston. The best concentration of storms will be north of I-10 and probably along or north of Highway 105. This would basically be Conroe, Huntsville, Lake Livingston, Madisonville, etc. That’s also where the best chance for severe weather will be in our area. The really nasty stuff will be way off to our north, up toward Lufkin and Shreveport, LA. More on severe weather in a second. You’ve mentioned severe weather. What do I need to worry about this weekend? The Storm Prediction Center has adjusted their outlook again today. Most of the Houston area is in a “slight” risk for severe weather. That increases dramatically to enhanced and then moderate as you head toward Lufkin and Shreveport. As mentioned above gusty winds and hail will be the main severe weather concerns this weekend around Houston. 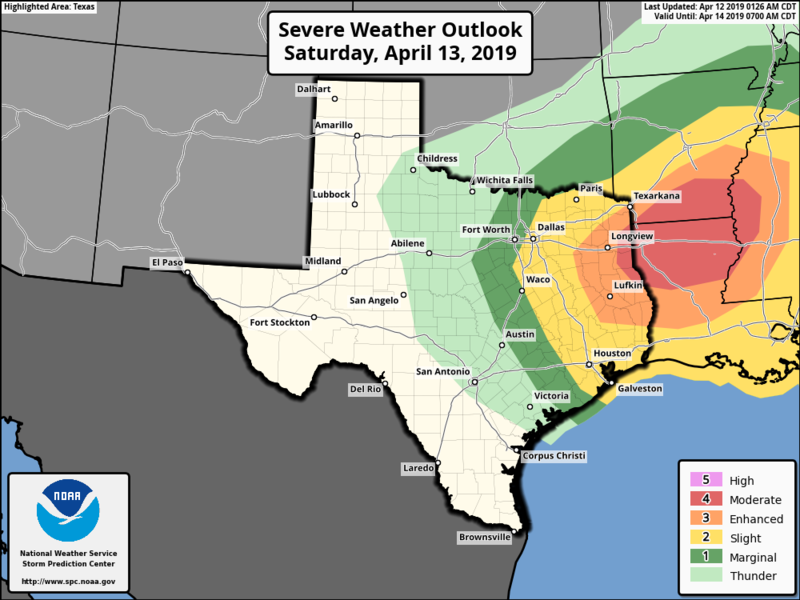 At this point, it would appear that Saturday’s storms will not be of the same coverage or intensity as last weekend’s severe storms were in the Houston area. Still, we’ll keep tabs on things to make sure that doesn’t change. As far as tornadoes go, they are unlikely in and around Houston. So what about the Houston area? What should we expect? While the heaviest storms and rain will lift off to the north of Houston, I do expect at least a line of at least broken storms to develop Saturday afternoon.I would probably expect that line of thunderstorms Saturday afternoon, most likely between 2 and 6 PM from west to east across the Houston area. I don’t expect it will rain that entire time, but look for a short period of some heavy rain and thunder as that passes through. To reiterate, if storms become severe, the main threats will be strong winds and hail. The most likely portions of the area to see this will be to the north and east of Central Houston. Again, this shouldn’t be like last weekend, but we will keep watch. How bad will it be farther to the north? There are a good number of ingredients in place for a fairly significant severe weather outbreak in northeast Texas, northern Louisiana, and southern Arkansas tomorrow. This will include tornadoes. So if you’re traveling toward Shreveport or Lufkin or Natchitoches, LA or Monroe, LA, make sure you have a way to get weather warnings. Any flooding to worry about? Not in the Houston area. I will keep tabs on the more organized storms north of Houston though that could be capable of producing a couple inches of rain in a short time, which could lead to some isolated street flooding north of about The Woodlands if they get gnarly enough. Total rainfall should a quarter inch or less on average along and south of I-10. 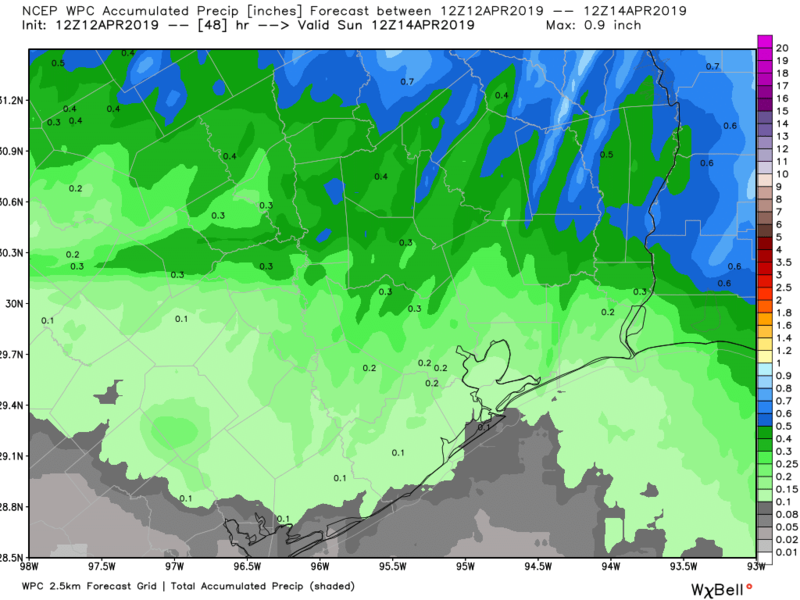 As you go north of Houston it increases to a bit less than half an inch in Spring to about a half-inch in Conroe to about three-quarters of an inch in Huntsville. Again, that’s an average, so some folks may see more rain and others less. I have an outdoor event scheduled for 2 P.M. Saturday. Should I cancel? Saturday is the worst kind of weather day because nothing about the timing is a slam dunk. We know there will be rain chances most of the day, but we know it won’t rain the whole day. We know there is a good chance of thunderstorms, but we don’t know precisely what time each location will see them. The best advice I can offer? If you are south of I-10, plan to go through with your event, but have a plan in place to get indoors if storms come through. North of I-10, you may be fine, but your risks for rain and storms are higher, so you definitely want the ability to get indoors if needed. The best chance of a washout Saturday is from Conroe north/east. The least chance is from Pearland south. For those hoping that things hold out for the Art Car Parade, I wish I could give you better guidance, but it’s about as coin flip as it gets unfortunately. Skies clear out rapidly on Saturday night, and Sunday will live up to its name: Wall to wall sunshine. With temperatures starting in the 40s or low-50s and finishing in the low-70s, it may be a top 10 day of the year. We’ll have a similarly beautiful day on Monday and add a few degrees. Clouds increase on Tuesday, and Wednesday should see another storm system and cold front bringing a chance of showers and storms. That clears out Thursday, setting up another round of beautiful weather then and for Friday. It’s still a good nine or ten days out, but early indications suggest a mostly pleasant Easter weekend is ahead for our area. I would classify rain chances as around or lower than average right now. Temperatures will probably be a couple degrees below average, which would mean lows in the 50s or low-60s and highs in the upper-70s or low-80s. Fingers crossed that we keep that going. When you say “tonight” for rain, do you expect 8pm as some models suggest, or later in the evening? More likely later in the evening, but the chance isn’t zero at 8. Just higher chances overnight. My son is doing the Savage Race Central Texas on Saturday in or near Belleville, I would feel remiss not asking about the outlook there for Saturday? Similar to elsewhere, but ending a bit earlier. Scattered showers and thunderstorms from morning into early afternoon. Matt & Eric…boy do I appreciate the “no hype”…this morning’s Chronicle AP piece, page A9 sub-title, “Severe weather from ‘bomb cyclone’ may impact Houston area”…couldn’t wait to get your perspective this morning…thanks again! My cycling club is getting ready for the MS150 and we’re supposed to be riding around Sealy/Bellville/Monaville tomorrow morning. Do you think we’ll be okay? You will probably have periods of some rain and a chance of thunder. @matt Do you think it will be safe to be on a bicycle out on the roads? I prefer not to be struck by lightening. HA! I am driving to Austin Saturday morning around 8 am, will that be early enough to miss the developing storms in Sealy? You will hit periods of some rain, and you may hit heavier storms as you get closer to Austin. We are getting married in Magnolia outside at 5pm. What’s your gut saying? Will this happen?? Sorry…day may help. Our wedding is this Saturday, at 5pm, in Magnolia. If it rains, it would probably be mainly very early. The evening looks fine, albeit a bit breezy and cooler! We have a 5k in Sugarland at 8am Saturday and a kids’ dash at 9am. Do you think we’ll be ok? Okay, so I am getting weather news warnings from my Accu app stating that we could possibly have tornadoes tomorrow in our area. I never take any of them seriously until I hear from you all! Is this truly the case for the Bacliff Texas area?